Theologically – No! Because his allegiance is to Allah, the moon god of Arabia. Scripturally – No! 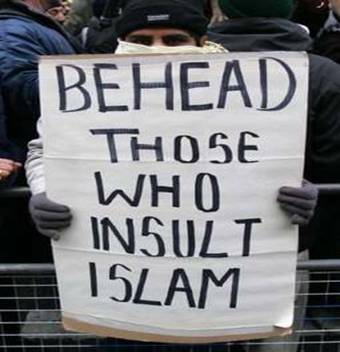 Because his allegiance is to the five pillars of Islam and the Quran (Koran). Geographically – No! Because his allegiance is to Mecca, to which he turns in prayer five times a day. Socially – No! Because his allegiance to Islam forbids him to make friends with Christians or Jews. Politically – No! Because he must submit to the mullah (spiritual leaders), who teach annihilation of Israel and Destruction of America, the great Satan. Domestically – No!. Because he is instructed to marry four women and beat and scourge his wife when she disobeys him. (Quran 4:34). Intellectually – No! Because he cannot accept the American Constitution since it is based on Biblical principles and he believes the Bible to be corrupt. Philosophically – No!. Because Islam, Mohammed, and the Quran do not allow freedom of religion and expression. Democracy and Islam cannot co-exist. Every Muslim government is either dictatorial or autocratic. Spiritually – No! Because when we declare "one nation under God," the Christian's God is loving and kind, while Allah is NEVER referred to as heavenly father, nor is he ever called love in The Quran's 99 excellent names. 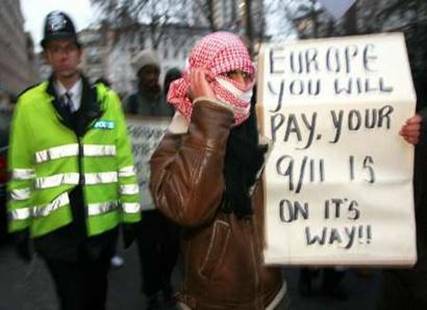 These pictures were not taken in the Middle East but in London, England. Counterterrorism expert Juval Aviv met recently with reporters at Fox News and revealed information, which he believes is accurate, concerning an imminent Al Qaeda attack on five to seven American cities simultaneously. "I predict, based primarily on information that is floating in Europe and the Middle East, that an event is imminent and around the corner here in the United States. It could happen as soon as tomorrow or it could happen in the next few months. Ninety days at the most,” said Mr. Aviv. “What they’re going to do," he explained, "is hit six, seven or eight cities simultaneously to show sophistication and really hit the public. This time, which is the message of the day, it will not only be big cities. They’re going to try to hit rural America. They want to send a message to rural America: "You’re not protected. If you figured out that if you just move out of New York and move to Montana or to Pittsburgh, you’re not immune. We’re going [to] get you wherever we can and it’s easier there than in New York." 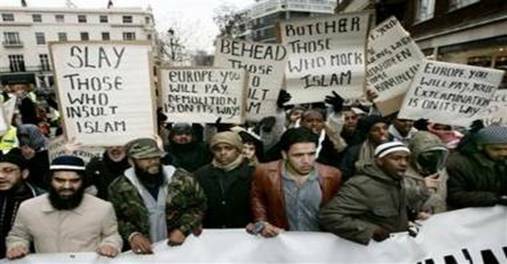 From the streets of England and by English citizens we can learn what Islam wants from us. On August 26, Islamist websites posted an item titled "How to Join Al-Qaeda." It is not clear when the item was written; it was produced by the website Al-Thabitoun 'Ala Al-'Ahd, which is affiliated with Al-Qaeda in Egypt and is currently inactive. The item calls on every Muslim to regard jihad as a personal duty and to take initiative to establish a jihad cell without waiting for recognition from Al-Qaeda. It goes on to elaborate on how to form and run the cell, how to raise funds, and how to select a target, "for example, assassinating the American ambassador," which, it states, "takes no more than a gun and a bullet." "Do you really have to meet Osama bin Laden in person in order to become a jihad fighter? Do you have to be recognized by Al-Qaeda as one of its members to become a jihad fighter? If Al-Qaeda commanders should be killed, would the jihad be eliminated? What would you do if Al-Qaeda did not exist today? How is Osama bin Laden different from you? — [yet] he managed to establish the world jihad organization. Who provided training to Osama bin Laden and Abdallah 'Azzam when they went to Afghanistan to become the first Arab jihad fighters? "Each cell should have a source of funding... When you have several members, you will [surely] find the funds for your cell... Then you should buy weapons, make plans, brainstorm, plot your plans, monitor your enemy's important objectives, and study its moves. Set a goal; for example, assassinating the American ambassador — is it so difficult? Is it [indeed] difficult for someone who has already crushed America in his home? "From the moment the cell is established, its members must be divided — into secret members, members who do not [act] openly and are not wanted by the authorities, and members who are wanted (who have been arrested in the past or on whom the intelligence apparatuses have a file)... The secret members must perform intelligence tasks, collect information, raise funds, recruit [new members], and assist in [actual operations]. Those who act in the open must perform the primary military operations, such as assassinations, firing at enemy facilities, etc. "Every jihad cell is a microcosm of the world jihad organization." In the last few days a terrorist attach was thwarted in Germany and Holland where large quantities of explosives were found and plans to blow up airports, military bases and tourist bars and restaurants. Who knows how many sleeper cells are in America and Europe right now. I am convinced that a true Moslem cannot be a true American Citizen because they cannot pledge loyalty to our constitution, a pluralistic society, or even non-violence. 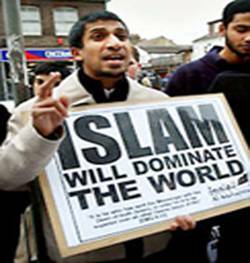 I admit that there are wonderful Moslems in America who even speak out against radical Islam and speak against their treatment of women, but you would have to call these good Moslems - Cafeteria Moslems because the radical Moslems are actually just following the Koran. I am not alone in this thought. There is a movement in Holland to end immigration and ban the Koran as a book that is dangerous to the state. There are members of the Labor Party in England advocating an end to all immigration of Moslems and to require oaths of loyalty by those living in England now. Unless Moslems, themselves, clean up their image, justified or not, there will be a backlash all over the western world. 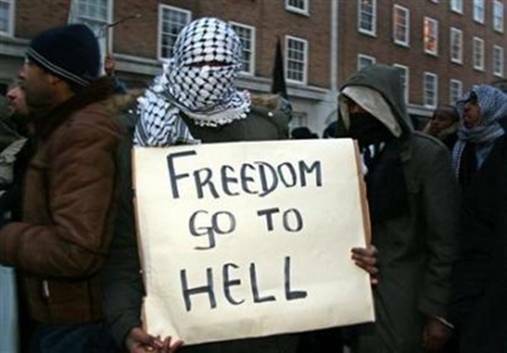 I would give Moslems the same rights in the West as they give Christians in their own countries. Maybe we should have invaded Iran instead of Iraq and now it is inevitable. Another invasion would be counterproductive and we do not have the military to do it. Going after the Nuke plants will do nothing to stop the support of Iran for terrorists all over the world including Iraq, Palestine and Lebanon. Iran has a good and honorable army and police force. They also have good people who have tasted western freedom and culture. But since Radical Islam took over thanks to President Carter, the government has created a special and separate army just to protect the government from the people and to promote and spread Radical Islam all over the world. No American politician will say this but I have seen the military plan to wipe out this special Islam Army without touching the real army and the people of Iran and do it in three days without any ground force needed. I am convinced this is inevitable and the only way out of Iraq. Right now Americans enemies in Iraq are 90% insurgents from Iran and Syria and not Iraqis. You can be anti-war all you want but you will see in time that this will have to happen sooner or later, and for my part it should be now. The history of the 19th and 20th century seems to teach with quasi-certitude that preemptive attacks by good governments against coming threats are better than letting them run in the long term (Hitler, communism etc.). If America had preemptively eliminated Hitler and Lenin or Stalin right at the beginning, we probably wouldn't have had such a 20th century. Half the people on earth would have aggressively complained about America because they would only see war but history would have seen the culmination of the power of evil in the 20th century. Instead these governments killed almost a hundred million of their own people. We could have prevented this and it would have been just even by Catholic standards of a Just War. War is only justified as protection of ourselves, or our neighbors and/or Justice. Peace without justice is slavery. In your recent newsletter you defended your position on the Iraq war and I would like to respond to why I and many other Catholics disagree with you. I think many Catholics were against the war for the wrong reasons and some including myself, were against it for the right reasons. Pacifist tendencies are behind most of the Catholic opposition which I strongly disagree with. I was against the war because of strategy. I don't think it was immoral, just that it was a mistake. I agree we are in an all out war with Islamic terrorism, I believe in a just war and the necessity of the Afghan war. taken control with the help of Iran and now Iran can stretch its borders to the state of Iraq and form a large terrorist Shia state. Now with our army stuck in Iraq we don't have the troops for any military involvement in Iran. The worst part is that we never had an army large enough to win the war. To control a country as violent and large as Iraq, required an army that only a military draft can provide. I also believe that you have missed the point that America has no interest in preserving Christian culture. The Muslims are fighting a religious war, but the West is fighting a secular war. They want to make the world save for their atheistic, free-market, democratic system. They want to turn the Middle East into a democratic region. The want to introduce abortion, contraception, materialism, and an exploitative economic system on a resource rich region. A one world government is what they want to establish. With Iran in a stronger position, Communism will use them to their advantage and try to impose their system instead of the Capitalist system of the West. you doesn't give you the right to do something bad back. An eye for an eye and a tooth for a tooth went out with Jesus "Love your enemy", "Bless those who curse you". The "What would Jesus do" principle applies. The war in Iraq is not morally right. Pope Benedict XVI is apposed. The Catholic Catechism is opposed. "There were not sufficient reasons to unleash a war against Iraq. To say nothing of the fact that, given the new weapons that make possible destructions that go beyond the combatant groups, today we should be asking ourselves if it is still licit to admit the very existence of a 'just war'." You suggest that there is a plan to attack and destroy Iran in three days implying it is the right thing to do because there would be no ground forces required and no loss of American life? Is your life so much more precious than theirs? Just nuke them (mini nukes) and your problems will all be solved? The Way of the Cross my friend -- that is the only answer. I see no other solution except to take out Iran's special force that is spreading terror all over the world and then let the good Iranians take back their government and they will. It is easy to say we should not, but I read everyday the thousands of Christians being killed in Moslem countries on a daily basis and the tens of thousands being held as slaves in these countries. I agree that we will do nothing and then we will face World War III. These people are so bold they don't even try to hide it. They know that the average American who watches 3-4 hours of brain numbing TV each day will never believe the truth! Those who try to let the truth be known are marginalized, labeled conspiracy theorists, non-patriotic Americans etc. They lose their jobs, reputations, and some even their lives. Concerning the later check out Michael C. Rupert who has left the US and now resides in Canada in fear for his life if he returns to the US. Dr. Steven Jones was 'forced' into retirement. Keven Ryans was fired. The same principles of manipulation are used by those who promote the false apparitions like Medjugorje. They use fear mongering to and other emotion manipulating techniques to trap even pious devout souls into their fraudulent schemes. Hitler himself said that if a lie is big enough everyone will believe it. Draw a parallel between the Germany in Hitler's time and USA today. They were a very advanced culture but got conned into following a very evil leader and the rest is history. Check out the links between the Bush family and financing of the Nazi regime. Check out the links between the Bin Laden family and the Bush family. Check out the links between Bin Laden, the CIA and Afghanistan. The point I am trying to make is if you want the truth you aren't going to find it in the main line media. The solution is the Way of the Cross. Prayer and the sacraments. The scourge of war is the result of sin. We live in culture of death under the tyranny of moral relativism. The battle we fight is not with earthly armies it is a spiritual battle. How does nuking Iran stop the use of artificial contraception? How does it stop abortion? How does it stop homosexual behavior and all other sins against chastity? End the evil within before we start trying to end the evil in someone else. Take the plank from our own eye before we take the speck from our neighbor. The solution isn't political, it is spiritual. I suspect we are going to reap what we have been sowing since 1968 when Humanae Vitae was given to us. We are so blind in North America to our sinful lifestyles we cannot see the truth. If US attacks Iran what do you suppose the reaction will be by the rest of the worlds Muslim population? What do you think Satan wants to happen? War! World War II could have been avoided if enough people had followed Our Lady's warning at Fatima and stopped sinning! What do you think is going to be the price to pay for the 900,000,000+ aborted babies globally since 1926? I suspect there is going to be Christian martyrdom on an unprecedented scale. What about the countless spontaneous abortions due to artificial contraception? Why hasn't there been some kind of divine intervention by now? What is holding back the just wrath of God? We are in the period of Divine Mercy in my opinion but I don't know how long it will last. Keep praying and sacrificing, many Rosaries and Holy Hours of Adoration, and the Holy Sacrifice of the Mass that is what I recommend. Our Lady said that in the end her Immaculate Heart would triumph. What this writer says may even be true but the USA gets 90% of its foreign oil from Mexico's off shore oil and Canada's oil shale. We get only 10% of our oil from Saudi Arabia. 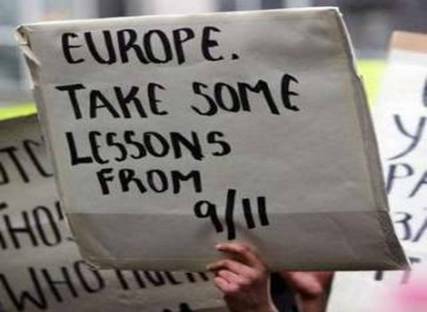 It Big Oil (the Illuminati of London City) did help in 9-11 and that may be, it has nothing to do with what we in America have to do to stop terrorism. Maybe my biggest reason for trying to gain support for the war is the Republican and Democratic Candidates for the Presidency and the House and Senate. Every anti-war Politician is pro-abortion. And every pro-war Politician except Giuliani, is anti-abortion. The total American dead in our war against Terrorism including 9-11 is less than 10,000 but the total dead by abortions is over 100,000,000. My secondary reason for being pro-war is the 101 prophesies I have studied about the coming Chastisement. I am now convinced that the Chastisement will be international simultaneous civil wars all over the world. This can only happen by both a world wide economic crash and internal terrorism by Moslem citizens attacking their own country. England's tolerance of the above pictures will be their downfall.